David McLaren first entered the real estate industry in 1985 and since then has been involved in various aspects, including the ownership of real estate companies, as well as property management. David also holds a Diploma of Horticulture, a Diploma of Business Studies and is AREINZ. 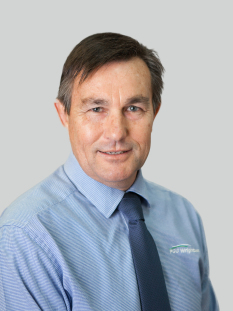 He has recently sold his real estate business in Tauranga to join PGG Wrightson Real Estate as he believes it to be one of New Zealand’s recognized market leaders in rural sales. David has a farming background, growing up on a 400 hectare dry stock farm just out of Rotorua and then horticulture blocks in Te Puke. David and his wife reside in Te Puke and own an avocado and kiwifruit orchard. He is a keen sportsman with a love of fishing and mountain bike riding. David is keen to put his vast real estate experience, skills and high level of integrity into assisting both buyers and sellers with all their real estate needs.